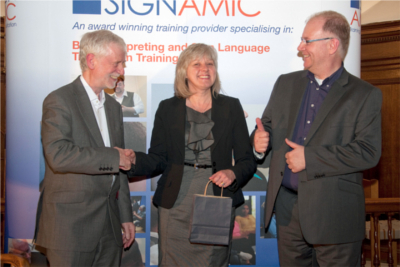 Signature Chief Executive, Jim Edwards, was pleased to attend the fourth Signamic Annual Graduation Ceremony. 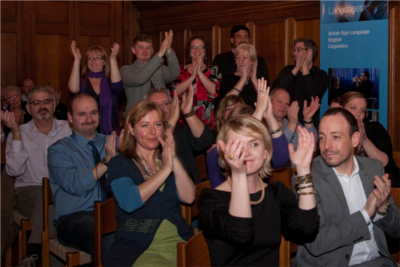 The celebration of students' achievements took place on Friday 26 April. More than 70 people received their awards this year, many of them having achieved Signature qualifications. They included a group of officers from the Metropolitan Police Service who gained the Signature Level 3 NVQ Certificate in British Sign Language after a fast-track training and assessment programme in time for the London 2012 Olympics and Paralympics. Special guests Jim Edwards and Jeff McWhinney, Managing Director of Significan't (UK) Ltd, each made a short speech after which they presented the students with their awards. A drinks reception followed with an opportunity for the students to celebrate with friends, family and the Signamic team. Well done to everyone who received a Signature qualification this year.